Oh, Fresh. Just when I think you've done it all, you go ahead and come out with a brand-new addition to your Lip Treatments! 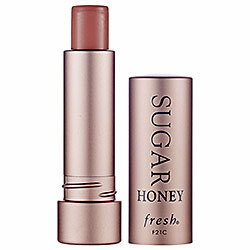 Introducing the fabulous Fresh Sugar Honey Tinted Lip Treatment SPF 15. Much like its counterparts (Sugar, Sugar Plum and Sugar Rose), Sugar Honey tastes delicious and makes lips feel super soft and smooth. This is due not only to sugar (a natural humectant that ensures long-lasting moisture), but to meadowfoam and black currant seed oils, which hydrate and condition the lips. The balm also contains antioxidant-rich vitamins and the aforementioned SPF 15, so your pout is fabulously protected all day long. While the balm is a coral-bronze hue in the tube, it actually imparts a beautiful rosy tint. I've actually found that the moisturizing properties seem to last longer with this one than with the other three as well! Fresh Sugar Honey Tinted Lip Treatment SPF 15 retails for $22.50 at sephora.com. This sounds like a nice product, I'd quite like to try it actually!